We wanted to share more from Zach & Andrea’s wedding day. Here are some highlights of their wedding preparation. You can see more of their day here. Here's to Moms - Happy Mother's Day! If you haven't seen this on You Tube.....where have you been. Okay maybe you spend a little less time on the internet than me. This is the great summary of all the oh so familiar words we heard growing up and may have even found yourself using today with your own kids. One of Ethan's first videos was done to the William Tell Overture, it is very fitting to the pace and life of being a mother. We came across Aletha's blog in our surf from blog to blog. It is amazing the kind of information that is available on the internet. 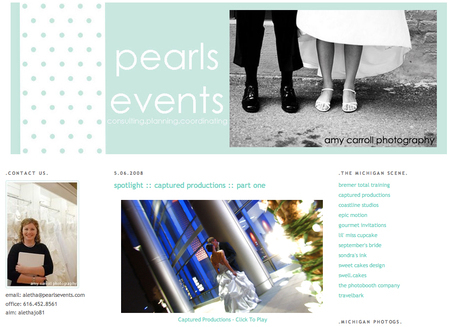 Being in the wedding industry and shooting a lot of Grand Rapids weddings we were very excited to come across pearls events blog and website. Aletha invests a lot of time and effort into covering all aspects of the wedding industry. Perusing through her blog I felt like I was looking at a bridal magazine except you can watch video on it too....sweet! Many couples these days are part of myspace, facebook, and the online generation. It is great to see a wedding coordinator who is in touch with where her clients are coming from and offering such a wealth of information. We were honored when Aletha asked us to be interviewed for a spotlight post on her blog. Check out this interview on her blog. If you want help in planning your wedding day or if you want to be a guest at your own wedding, or if you just want some great ideas check out pearls events blog and website. Since we are inspired by the world around us, we will from time to time post an inspirational clip that grabbed our attention. I love what is said by this commercial, it is easy to think that someone we look up to just got there or somehow it came easy. There is no substitution for hard work. For all those other MJ fans out there, enjoy this walk down memory lane.